On July 31, KTAL simulcast the live feed from the International Space Station to Las Cruces City Hall on Tuesday, July 31 from 8:55 to 9:15 am. NASA astronaut Ricky Arnold answered questions from Las Cruces students. KTAL-LP 101.5 FM celebrated Space Week in conjunction with the Las Cruces Space Festival. Monday April 9 through Friday April 13, 2018, we aired special science programming. The daily programs were hosted by Nan Rubin and Vince “Dr. Science” Gutschick. Live and recorded guests will be scientists, researchers, educators and others involved with such topics as satellites; space exploration; and STEM education. ​On Saturday, April 14, at 2:30 we made our first remote broadcast from the Rio Grande Theater. The broadcast coincided with the festival's full day of events downtown. Check out the June 25, 2107 Sun-News story on the upcoming roll out of the station. Board member Peter Goodman wrote about the benefits of community radio in this opinion piece in the Las Cruces Sun-News. A new community radio station came on the air in Madrid, NM! Visit the Prometheus Radio Project Website for more information on community radio, or the Petri Dish website for a different take on low-power FM stations. 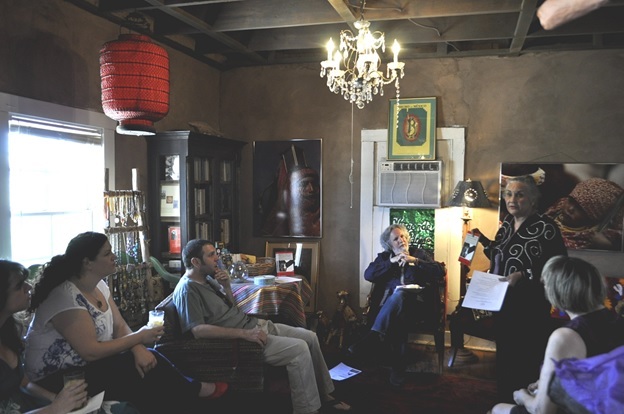 KTAL organized Speak Easy -- the first Las Cruces Literature Crawl/Story Stroll. It was an afternoon dedicated to readings by local authors, poets, storytellers, and students of writing. ​Thanks to following persons who helped and supported Speak Easy!